Tarkanian, at 37 percent, towers over the other candidates remaining in the primary. Michelle Mortensen gets just ten percent, Scott Hammond gets nine percent, and David McKeon gets one percent. Victoria Seaman, who dropped out of the race upon Tarkanian’s entry with Trump’s endorsement, got nine percent—while 34 percent were undecided. 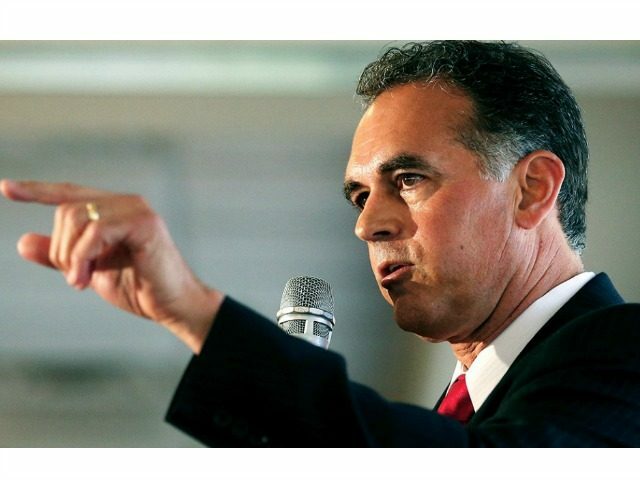 Tarkanian, a strong supporter of President Trump, was the GOP nominee for this very seat in 2016, but lost to now Rep. Jacky Rosen (D-NV) in the general election after 2016 GOP senate nominee in Nevada, then-Rep. Joe Heck (R-NV) tanked Republicans statewide by distancing himself from Trump in the leadup to election day. Rosen is running for the U.S. Senate and is expected to face off against Sen. Dean Heller (R-NV) in the November general election. Trump’s approval rating in the survey of Nevada third district GOP voters is very high. A whopping 72 percent have an “extremely favorable” opinion of Trump, and another 16 percent have a “somewhat favorable” opinion of the president. Only four percent have a “somewhat unfavorable” opinion of Trump, and just six percent have an “extremely unfavorable” opinion of him. Tarkanian was running against Heller for the GOP nomination for U.S. Senate until Trump asked him to switch to the House race so as to give the party a better chance in the general election in both the Senate and House races. I entered the U.S. Senate race after receiving an outpouring of requests from Trump supporters throughout Nevada, many of whom stood by both me and Donald Trump in 2016. These grassroots supporters saw in me a fierce defender of President Trump’s America First agenda. Late Wednesday, the President and members of his political team reached out to me and asked me to consider supporting the America First agenda as a Congressional candidate by running again in CD3, where I nearly won in 2016 in what was one of the most expensive and closest Congressional races in America. This was not something I ever considered. In my travels throughout the state, I’ve had so many wonderful people thank me for running for the US Senate. They believe in our message and the cause. My incredible staff, mostly volunteers, have invested thousands of hours into this cause. I owe an enormous debt of gratitude to them all. I do not want to let any of them down. I have always believed that public service is doing what is in the best interest of the people you represent, not yourself politically. I believe with every ounce of my body that the future of our country, and a better life for our children, requires the implementation of the America First agenda. I am confident I would have won the US Senate race and done a great job representing the people of Nevada in the Senate, but the President is adamant that a unified Republican ticket in Nevada is the best direction for the America First movement. With President Trump’s full support and endorsement, I am filing to run again in CD3 with the firm belief that we will finish what we started in 2016 and win in 2018. In a subsequent appearance on Breitbart News Saturday on SiriusXM Patriot Channel 125, Tarkanian laid out the stakes of this race. In a year where Democrats are on the offensive, Tarkanian is exactly right that if the GOP has a chance of holding the House they need every advantage they can possibly get—especially pickup opportunities like this one. This particular district is one of a handful in the country where a Democrat currently represents it, but Republicans have a decent shot at a pickup. Assuming Tarkanian’s lead holds and he solidifies the nomination quickly, with Trump’s support in the general election, he will face off against Democrat Susie Lee in the general. Lee is considered an easy target to beat, given her close ties to House Democratic leader Nancy Pelosi, and problems already piling up for her campaign. Supporters of the president and his agenda are hopeful that the other contenders in the primary clear out of the way for Tarkanian to represent the party, as the president wants, in the general election. If that happens, the district could represent a battle between two national movements: The Women’s March, #MeToo-fueled leftist resistance to Trump versus the economic nationalist conservative base of the president. Republicans and Democrats will likely both nationalize this race, and both parties are likely to compete heavily in Nevada’s third district. The suburban district just outside Las Vegas has traditionally been a swing district, but Republicans have generally held it in its current form.